A champagne/beige fascinator set on a comb and trimmed with beads. This size of fascinator is excellent for those ladies who are not used to wearing a fascinator. Simply Devine is a milliner of fine hats. 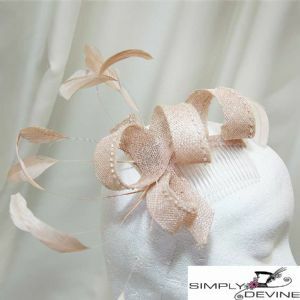 At the Simply Devine boutique, you will find hats and fascinators, from top London designers, and our own range, designed by milliner Liz Devine-Wright. Simply Devine is one of Yorkshire’s very best specialist hat shops, offering designer label hats and fascinators, including an extensive range of accessories including co-ordinating handbags, wraps and jewellery.